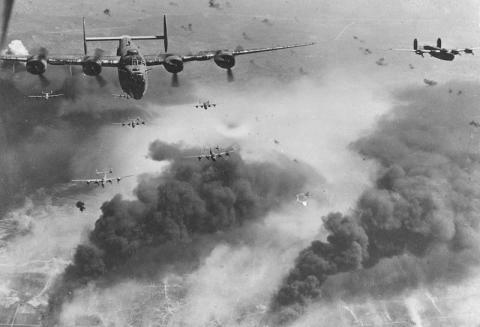 B-24s, like other WWII planes, took the fight to the skies in both the Pacific and European theaters. Photographs, from the U.S. National Archives, give us a glimpse at some of the aerial battle scenes. Bursting apart, in flames, this B-24 was lost one month before Hitler took his life (thereby ending the war in Europe). Louie and his crew mates lost good friends as they - and their B-24s - tried to take back Japanese-held islands in the Pacific. "Super Man," and its crew, faced their own potential disaster on the day the men flew their Liberator to Nauru Island.